MICROCHIP Technology has unveiled a new 150mA low dropout regulator (LDO) in a tiny, space-saving 5-pin SC-70 package. Customers can now replace SOT-23 LDOs with a 50 per cent smaller footprint solution without compromising performance. 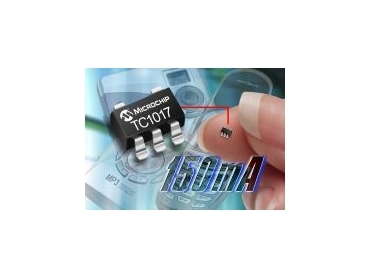 Microchip's TC1017 LDO has a low dropout voltage of 285mV at 150mA and a low-supply current of 53μA, which significantly extends battery life and improves system efficiency. The features of this new device improve system performance, reduce board space and minimise system cost, which makes the TC1017 one of the best SC-70 LDO choices for any battery-operated application. Microchip vice president Larry Ross said the device offered a smaller packaged alternative to existing LDOs on the market, while delivering superior performance. "The TC1017's high-output voltage accuracy, at ±2.5 per cent maximum, and its excellent dynamic behaviour meet the most demanding power supply requirements." A shutdown mode is also provided to further reduce power consumption to as low as 0.05µA. In addition, the device's tiny package and small external ceramic capacitors save board space and minimise component cost. The TC1017 features a maximum output current of 150mA and is offered with a variety of output voltage options. Tiny size, low-dropout voltage and minimal supply current make it suitable for space-critical or portable applications.